Categories: Fishing Gear, Hard Lures, Lures, Baits & Attractants. For more than 50 years, the legendary Arbogast Original Jitterbug Wakebait has delivered superb performance through its characteristic “plop-plop-plop” sound that millions of anglers worldwide can easily recognize. Thanks to its cupped lipped placed in a special angle, it produces a loud, rhythmic noise that makes it the ultimate topwater lure for nighttime fishing and an excellent bringer of explosive strikes during the day. 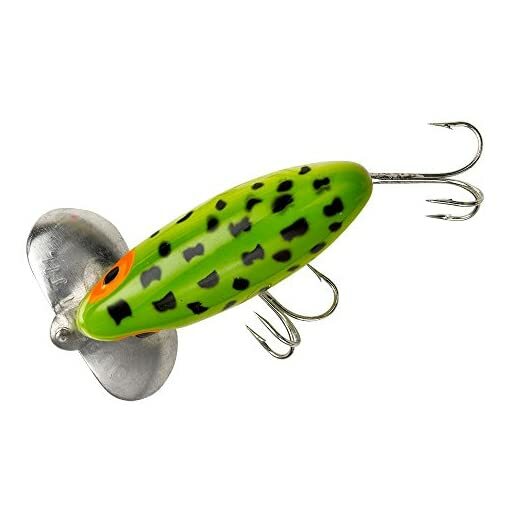 Bass, pike, muskie and panfish just cannot resist the attraction created by the Jitterbug’s tantilizing vibrations. If you like fishing with the Whopper Plopper, be sure to check this lure out! Its a similar topwater lure that creates lots of commotion to draw strikes. The Jitterbug is available in 3 sizes and 4 colors to maximize the applicability to a wide variety of water conditions. The Arbogast Original Jitterbug Wakebait is a legendary topwater lure that has a distinctive sound. Premiere nighttime lure but also excellent for explosive strikes during the day.